The Falkor team completed the first-ever high-resolution map of deep reefs near the island of Roatan in Honduras. This new resource can be used for many purposes, including to aid future research in the area on the corals and other animals found there, as well as also enabling increased conservation of the reefs. When Dr. Peter Etnoyer, a marine ecologist at NOAA’s National Centers for Coastal Ocean Science, realized that R/V Falkor would be headed for the Panama Canal after the Oases 2013 project, he saw a unique opportunity looming. Since 2010, Etnoyer and his colleagues, with support from Schmidt Ocean Institute, have been exploring small portions of the deeper slopes on the Meso-American Barrier Reef off Roatan’s coast. They’ve worked from the Idabel submersible that Karl Stanley built himself. A garden of crinoids on a deep Roatan reef. But that research was almost hit-or-miss at times because existing maps for these reefs were of such low resolution. Like many remote regions, the best available seafloor maps come from satellite data and have a resolution of at best 1km—that means you can’t even discern the rocky plateaus and outcroppings where corals are found, which are typically much smaller than a kilometer. But, Falkor’s sonar system creates maps with resolution in the 5 to 10-meter range, which reveals those critical features. After realizing how close Falkor would be to Roatan on it’s trip to the Pacific, Etnoyer and Matt Rittinghouse, a graduate student at the College of Charleston whom Etnoyer is advising, put together a quick proposal requesting that the team divert there to map a huge swath of the barrier reef’s deeper reaches. The project was quickly approved as a perfect fit for Schmidt Ocean’s mission to generate new ocean knowledge and make it publicly available. By the end of the day on July 10th, the ship’s crew had mapped a few hundred square kilometers of the continental slope in depths mainly from 300 to 1,000 meters, but as deep as 2,500 meters. The total area covered is in the range of 300 square kilometers. The maps will allow researchers to target the most interesting portions of the reefs for future explorations. Etnoyer’s team hopes to use the new map to identify and then explore new ridges and gullies no one even knew existed. And, if all goes well, the Ocean Exploration Trust, founded by Robert Ballard, also plan to use their impressive Hercules ROV to explore portions of these deep reefs as well, which would offer much more sample collection than possible with Idabel. The maps should also be a major step forward for deep reef conservation. As of this writing, a large chunk of Roatan’s portion of the barrier reef is set aside as the Sandy Bay West-End Marine Reserve, but that was designed to protect shallow corals and does not extend very far out to sea. That means the area’s spectacular deep reefs, which support countless fish and corals, are open to fishing. 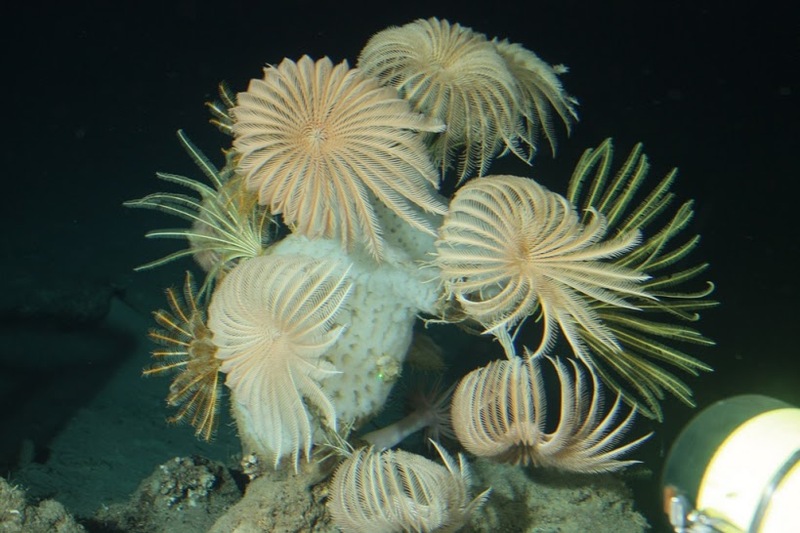 Etnoyer and Rittinghouse combined the results of past research on where deep corals are found, and data from past Idabel video surveys, with the new mapping data to delineate key deep-sea coral habitats. 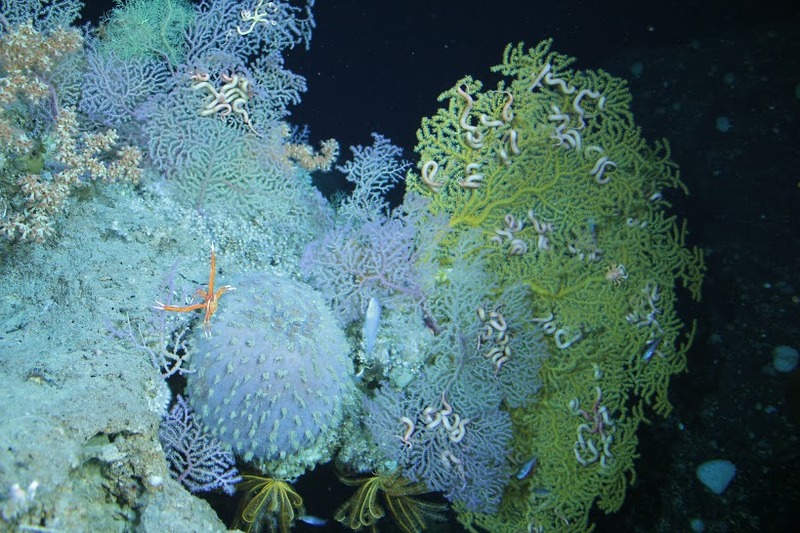 Once this knowledge is available, local organizations, which strongly supported the permit application for the Falkor work, planned to push to extend the bounds of the protected areas so that the lesser-known but critically important deep reefs can also be protected. “Our role here is to provide as much useful information as we can to the local groups to help them make their own management decisions,” said Etnoyer. The researchers have processed the data into maps that are planned to be distributed to Roatan groups and officials, and added to Google Earth. Raw mapping data from a pass with Falkor's sonar. No cruise log entries at this time. 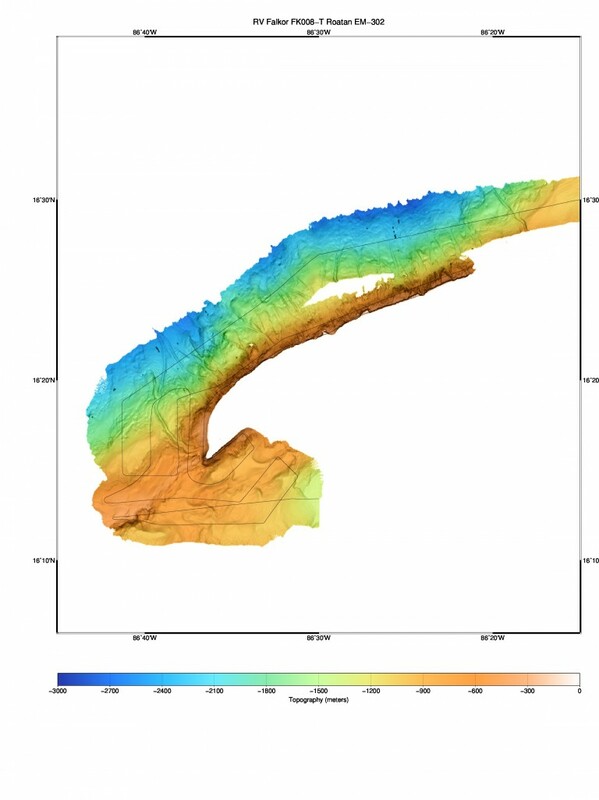 The resulting bathymetric data from the multibeam mapping of the Roatan Peninsula using Falkor’s Kongsberg EM302 and EM 710 is being stored at, and is downloadable from NOAA’s National Geophysical Data Center. The multibeam mapping was conducted July 9-10, 2013 with Falkor making a side trip to conduct the mapping on its way toward passing through the Panama Canal. 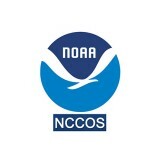 The Deep-Sea Coral Habitats Progress Report, provides a summary of research activities conducted by Dr. Peter Etnoyer (NOAA) and his laboratory staff under a long-term Memorandum of Agreement between Schmidt Ocean Institute and NOAA’s National Centers for Coastal Ocean Science. No cruise related news at this time.